So, hey, everyone…I know you are dying to hear about TOOTHPASTE! That’s right toothpaste is on the board today, and I have spent about two weeks testing 3 different brands. First, though, a little lesson about toothpaste (okay, it’s kind of a big lesson, but bear with me). I think it is safe to say that the things we want toothpaste to do are: clean the tooth surface, prevent cavities, bad breath, and gingivitis, and whiten the tooth surface (or at least reduce the staining that can happen with food, drink, smoking, and age). Cleaning and whitening are usually accomplished with detergents and abrasives. The most common detergents in toothpaste are sodium lauryl sulfate or sodium laureth sulfate, and no doubt, if you are reading my blog you may already have seen it listed as things that companies are removing from their products. Why are these bad, you may wonder? Why the heck are they in everything from shampoo to…toothpaste? Well, as a surfactant, it makes things slippery and disassociate from surfaces (helps get things unstuck) and it also emulsifies, keeping things in solution (those unstuck particles stay unstuck). This is ideal for cutting through grease, dirt, and for your teeth…plaque and bacteria. Not a bad thing. For hair, these surfactants can be too strong, stripping hair, and leaving it feeling like straw. They’ve been officially labeled as “human irritants,” with the “laureth” version being much more irritating than the “lauryl” variety. If you want to avoid these, it’s not hard to do these days…do as you like, but I wouldn’t call them “toxic” or “dangerous,” just irritating. If you are prone to “canker” sores or “gum boils” (as my grandmother called them), it may be the SLSes to blame. Abrasives can be any variety of particles meant to polish your teeth with the physical action of scrubbing. These should be mild, obviously, to prevent damaging your tooth enamel. Common abrasives are aluminum hydroxide, calcium carbonate, calcium hydrogen phosphates, silica, mica, zeolites, and hyrdoxyapatite. Based on my research, the only one you should try to avoid is aluminum hydroxide for its suspected toxicity. Most whitening-action toothpaste, as it turns out, whitens more than regular paste due to “more polishing” and therefore more abrasiveness. Be mindful of these varieties as they may end up doing more harm than good in the long run. This is probably the most controversial topic I’ve written about yet, because if you start looking, you will find whole websites dedicated to the vilification of fluoride, while others (like most of us have been taught) promote fluoride as THE ingredient that prevents cavities. There are so many studies about this, and so many things that people claim are fact without any references, so I don’t want to promote a culture of reactionary assumption. Honestly, you are going to have to decide for yourself on this one, but I’ll summarize my findings. First, let me explain that there are three different versions of fluoride used in toothpastes: sodium fluoride, sodium monofluorophosphate, and stannous fluoride (which is actually a naturally-occurring salt). My research has turned up evidence that only one version of fluoride actually helps harden teeth and this is stannous fluoride. The only toothpaste brand using this version of fluoride today is Crest Pro-Health. There are also “fluoride treatment gels” like Gel-Kam, OMNI Gel, and Flo-Gel that use stannous fluoride, but these aren’t intended for daily use and aren’t “toothpastes.” If you leave stannous fluoride on your teeth too long, it can discolor your teeth (but usually it’s not permanent), which may be why most companies don’t use it. Usually the discoloration is as white flecks (not that bad), or a golden brown (pretty bad). I could get into other chemical reactions, but let’s not. The research I am citing is from the American Journal of Dentistry, August 2011; 24(4) 205-10, from an article called: Enamel Protection: a comparison of marketed dentrifice performance against dental erosion. Note: dentrifice is just a fancy word for “toothpaste.” The authors, Faller, Eversole, and Tzeghai, compared our three previously mentioned forms of fluoride on actual cores of human teeth and with human saliva (okay, kind of gross, but at least it is realistic). The results were that stannous fluoride protected enamel the best against citric acid and phosphoric acid (common acids we consume in food and drink), while sodium fluoride and sodium monofluorophosphate were not significantly different than the control nor each other. So, long story short, if you want to use fluoride, you should go with the stannous fluoride. That’s Crest Pro Health. Have at it. It gets a 3/10 from EWG’s database. There has never been a single randomized clinical trial to demonstrate fluoridation’s effectiveness or safety. Fluoridation’s role in the decline of tooth decay is in serious doubt. Fluoride may damage the brain, lower IQ, and may cause non-IQ neurotoxic effects. Fluoride affects the pineal gland, thyroid function, causes arthritis symptoms, and damages bone. Fluoride may increase hip fractures in the elderly. Fluoride may cause bone cancer. Fluoride may cause reproductive problems. The chemicals used to fluoridate water are not pharmaceutical grade, but are usually the byproduct of the phosphate fertilizer industry and may be contaminated with a variety of other impurities that may include substances like arsenic. Many scientists oppose fluoridation. As of July 2011, over 3700 professionals have signed a statement calling for an end to water fluoridation worldwide (this statement and a list of signatories can be found on the website of the Fluoride Action Network (see: www.FluorideAlert.org)). So, like I said at the beginning of this section, there is so much research you can go hunting for yourself and make your own decisions. Another site you might want to check out is www.fluoridation.com. 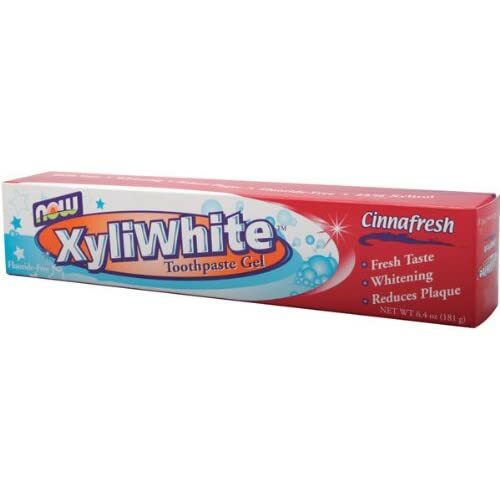 Xylitol – you probably recognize this from some sugar-free gums and candies, but it works to prevent bacterial growth and therefore prevents cavities and gingivitis; it also makes your toothpaste sweet and comes from natural sources. Stevia extract – a not so new to natural-living proponets, but new to most of us mainstream people, this is a natural non-caloric sweetener. Saccharine – less natural, used for zero-calorie sweeting, associated with cancer in rats, but is generally accepted as safe in small quantities…this is the sweetener in Sweet-n-Low. It only gets a 2/10 toxicity rating. Essential oils and plant extracts – in some natural toothpastes, this is another bacteria-fighting and additional cleaning ingredient. I would obviously read other things on the ingredient lists of the toothpastes you use and avoid those things that are otherwise harmful. The EWG Skin Deep database does contain a large number of toothpastes, so you can check out their toxicity ratings per ingredient. NOW, lesson over. Sheesh, I apologize. On to the taste tests! Toothpaste #1: Tom’s of Maine Whole Care with fluoride in Spearmint flavor. The fluoride is in sodium monofluorophosphate variety. The other ingredients are glycerin, water, calcium carbonate, hydrated silica, xylitol, carrageenan, spearmint leaf oil and other natural flavors, sodium lauryl sulfate, sodium bicarbonate (baking soda), and zinc citrate. It’s not animal tested, and Tom’s is committed to sustainable practices, recycling, being as natural as possible, and giving back to the community. So, it was not too gritty, and seemed adequately paste-y in a way that sort of reminds me of my childhood Colgate. It foams up like a “regular” paste and has the same level of refreshing minty-ness. It seems like the clean-lasting factor is about 3 or so hours, which is decent. Basically, this is your average paste with average results with natural ingredients. I give it 3 out of 5 stars. Toothpaste #2: Burt’s Bees Natural Toothpaste: Multicare with Fluoride in Peppermint flavor. The fluoride here is also sodium monofluorophosphate. The other ingredients are glycerin, hydrated silica, xylitol, calcium sodium phosphosilicate, sodium cocoyl glutamate, titanium dioxide, cranberry fruit powder, stevia extract, carrageenan, xanthan gum, silica, natural flavor, lecithin, and maltodextrin. So, this is free of SLSes, and you can tell since it is less foamy. The paste is noticeably grittier than average, and it looks slightly off-white and speckled from the cranberry fruit powder. The peppermint flavor is refreshing but doesn’t last. If you don’t get enough paste on your brush, it does seem to “go away.” When you DO get enough on your brush, the clean-feel lasts longer than Tom’s, which may imply more abrasiveness. I’ve already chatted up Burt’s Bees in other posts, so I’ll refrain now. And I also noticed a saltiness that isn’t extreme in any way, but noticeable. I would give this one 2.5 stars. 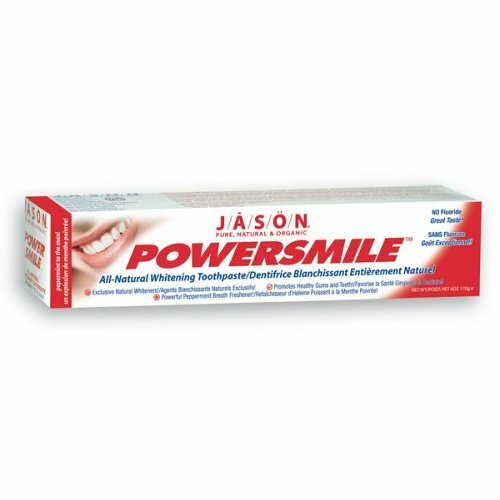 Toothpaste #3: Jason Powersmile All Natural Whitening Toothpaste in Peppermint flavor. There no fluoride in this toothpaste and I’m going to count that as a good thing. The other ingredients are calcium carbonate, purified water, vegetable glycerin, sodium cocoyl glutamate, peppermint oil, carrageenan, aloe vera leaf gel, bamboo stem powder, parsley extract, perilla seed extract, baking soda, silica, stevioside, grapefruit seed extract. I’m just going to come right out and say it. I love this toothpaste! It is strong on the peppermint side, so maybe that makes me “feel” like it is cleaning better? Very refreshing and lasting in flavor (think Altoids), as well as in that clean feel. And I’m not joking. On days when I used this paste, in the afternoon, I was still thinking, “wow, my teeth feel clean.” Again, this may be due to increased amounts of abrasives, but it may also be due to the increased amount of plant extracts that act as anti-bacterial factors. The paste color is a little tiny bit on the gray side and less paste-y in texture…more like a white gel, which I guess is the aloe. I’m giving this one a 4.5 out of 5. Now, interestingly, as I was doing all of this research I found this: “Most of the cleaning is achieved by the mechanical action of the toothbrush, and not by the toothpaste. Salt and Baking soda are among materials that can be substituted for commercial toothpaste.” So, you know me, I went and brushed my teeth with the magical baking soda. It seems to foam up on its own…this is the reaction of the basic pH of the baking soda with the acidic pH of the saliva. From an abrasive point of view it is mild, and it seems my brush alone would do a fairly decent job, and without the zing of peppermint or cinnamon, I’m left feeling just…salty. And it’s not very pleasant. And it’s drippy…like you can’t walk around the house brushing your teeth this way…at least I couldn’t. I would use baking soda if I ran out of Jason’s, but I’d prefer something like paste. 1 out 5 stars. Sorry baking soda.